Esxi 5.0 as Guest . ESXi with 3 VM's: Win7,Srv08R2, Srv2012. all just a fresh install. Thin Disks. Where is my fault that I'm not seeing benfits of compression and Dedup with veeam? I'm wondering what particular settings are specified for compression and deduplication options. Thanks. Compression is set to "optimal" and dedup is set "activ". I don't startet this Thread to say "Hey, Software X is better". Just made a first comparision to get a feeling. And what kind of compression/dedupe settings are configured on vRanger side? Are you considering full backup job runs in both cases? Forgot to ask - are there any disk exclusions specified? Also, as far as I'm aware, there are two types of backup supported by vRanger - physical and virtual. Which one is specified in your case? Thanks. Try backing up a different, production VM. I think what happens here is that the VM you are testing had a lot of data deleted from it before you started the testing (for example, setup files). This is not typical for standard workload of any Windows server application I can think of. Normally, the data set of any server keeps growing forever (and when data IS deleted, it is only deleted to be replaced with some new data, for example transaction log processing works like that). If you really want to "fix" this specific server's backup size, you can simply run sdelete against it. But again, under normal circumstances while backing up your production workloads, you should not need to be doing this. On an unrelated note, our "High" compression might be closer to what vRanger is using. Our "optimal" is specifically optimized for very low CPU usage. CPU usage becomes an issue when you have dozens of backup proxies backing up thousands of VMs, which is why this is the default. I do not realy got the point of you Gostev. What you mean with "had a lot of data deleted from it before you started the testing (for example, setup files)" ? Anton is talking about NTFS design here. Deleting files from NTFS volume does not change the actual content of the corresponding disk blocks, instead those blocks are marked as unused. Since Veeam B&R is a block-level image-based solution, all it cares is the contents of blocks. If a block is not zeroed, but has some data in it (though it might be marked as free by NTFS), it will be backed up. If you have large amount of blocks like that, those blocks get into the backup file and hence you see the large backup file size (while non image-based solutions will copy actual data only). This is why sdelete should help to obtain comparable backup sizes. Supi_Du wrote: 3 VM's: Win7,Srv08R2, Srv2012. all just a fresh install. Thin Disks. So these results looked somewhat suspicious to me, and I've asked our QC to perform the exact same test: backup fresh install of Server 2008R2. No extra steps such as drive cleanup or anything - literally just install OS, logon for the first time, and perform the backup. 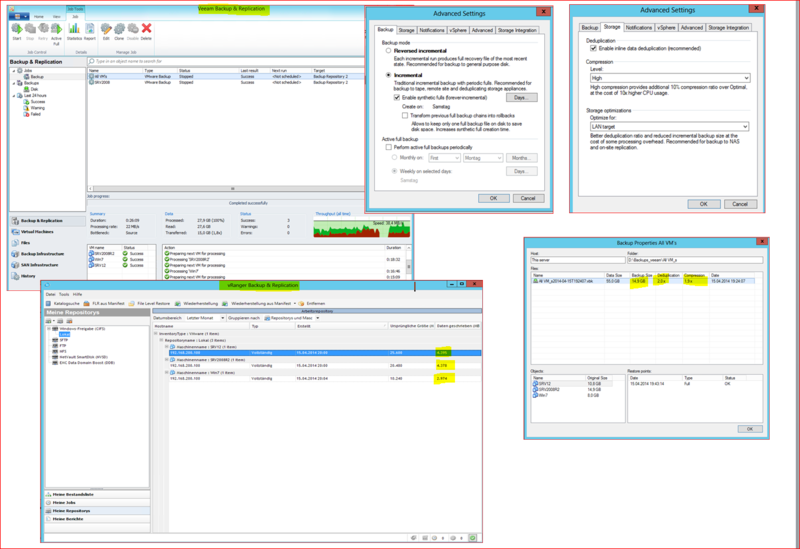 The first test where done with just default settings for both software, aka Optimal setting for compression in veeam. @Gostev: As we not compare the exact same environement your 4GB is not comparable. (As not written: your backup was runing against a fresh SRV2008R2 Install? Do you test the same Setup with Vranger ? Windows Server 2008 R2 with SP1 Standard Edition. Supi_Du wrote: your backup was runing against a fresh SRV2008R2 Install? Yes, fresh install of Windows Server 2008 R2 was tested. Btw, does the VM in testing consist of a single system disk? Yes single Disk. But as i wrote, you should test your own with vranger. Otherwise these results gives no real Information. Backup size of the same fresh Windows OS installation should be comparable, regardless of software used and other environment specifics. Btw, could you please check the file size reported by the OS, not the software itself?